To convert Windows Server 2012 Server Core interface to GUI interface, perform the following steps. 1. 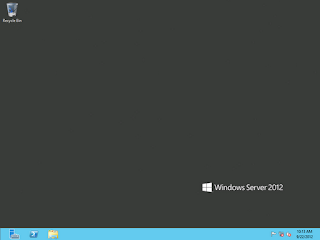 On a Windows Server 2012 server, log in as Administrator. 2. Insert "Windows Server 2012 DVD" into the server. Assuming D drive is the DVD drive of the server. 3. 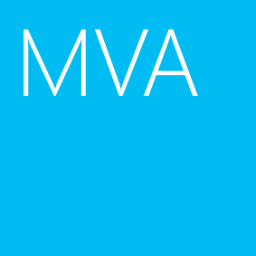 Perform "PowerShell" in a "Command Prompt". We need to mount the Windows Server 2012 image on a folder before installing the Windows features because the roles or features of Windows Server 2012 are not install in Windows Server 2012 Server Core environment. If there is no Internet access for the server, mounting the Windows Server 2012 image can provide the source for installing Windows feature. 4. 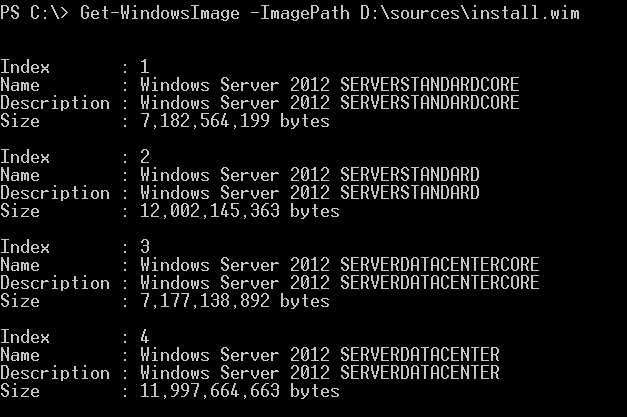 Perform "Get-WindowsImage -ImagePath "D:\sources\Install.wim". In my test environment, I need to mount "Windows Server 2012 SERVERDATACENTER", index 4 , on a folder. 5. Perform "New-Item C:\WinSources -Type Directory" to create a new folder. 6. 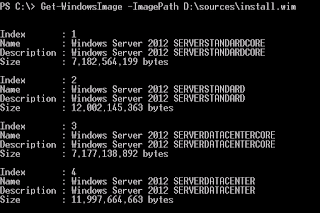 Perform "Mount-WindowsImage -ImagePath D:\sources\Install.wim -Index 4 -Path C:\WinSources -ReadOnly". 7. Perform "Install-WindowsFeature Server-Gui-Mgmt-Infra, Server-Gui-Shell -Sources C:\WinSources\Windows\WinSxS". 8. Perform "Restart-Computer" to restart the server. 9. After restarted, log in as Administrator. As a result, the server has been changed to GUI interface.